The main feature of this cottage is the 2000 sq ft attached pool building with a 40 ft Indoor pool and a 10 person hot tub. The warmth (30 C water temp) of this year round facility will keep you bug free in the warmer months and leave you forgetting about the Caribbean in the colder months. Go jogging indoors as 25 laps of the pool is one kilometer. 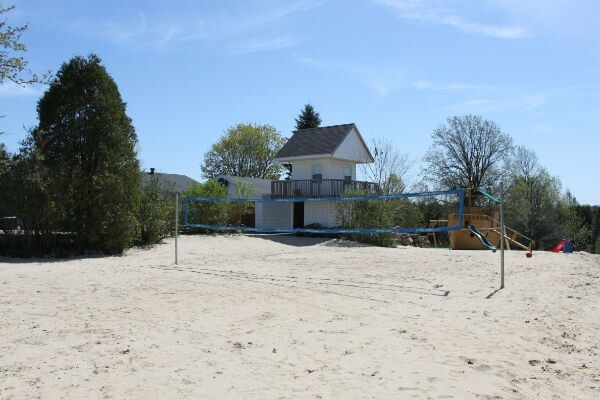 There are three acres of landscaped grounds with three BBQs (one with rotisserie), full size sand filled regulation beach volleyball court, fire pit, children’s play structure, sandbox, tennis and basketball court on the 5000sq ft asphalt sealed driveway and a toboggan hill (toboggans supplied). Seasonal vegetables are available in large organic garden. Inside there is WiFi access for your laptops and devices, 8 x 4 pool table, darts, board games, satellite TV (2 x 60′, 1 x 51′, 1 x 42′ and a selection of movies) plus three XBox’s (1 Kinect, 6 controllers, and a selection of games). This is an ideal vacation for large family gatherings, groups,several families or as a corporate retreat. NIGHTLY RATE IS FOR UP TO 24 GUESTS. EXTRA CHARGE OF C$ 25 PER GUEST PER NIGHT OVER 24 PEOPLE. A C$ 250 DEPARTURE CLEANING FEE PER BOOKING. A C$ 1000 REFUNDABLE DAMAGE DEPOSIT PER BOOKING. ALL RATES ARE QUOTED IN CANADIAN DOLLARS AND INCLUDE ALL APPLICABLE TAXES. THERE IS A $400.00 SEPTIC FEE FOR ALL BOOKINGS. JULY/AUGUST AND PUBLIC HOLIDAYS HAVE A 3 NIGHT MINIMUM STAY. It is a nice rural area with all the advantages of two of the larger cities in Canada. Ottawa, Canada’s Capital and Montreal with its French influence. New York State in the USA is only 15 minutes away and is the gateway to the Adirondack Mountains(Americas Largest National Park)with Lake Placid a beautiful two hour drive from the cottage. The area is in the centre of a lot of Canadian culture and the St Lawrence River with all its water related activities is 15 minutes away.